Stomach ulcers in adults can be pain-riddled, uncomfortable ailments if not managed properly. Although most ulcers can be cured, any treatment will take time and in the interim, steps will need to be taken to avoid aggravating the sore. During the recovery period, a stomach ulcer diet is usually called for. This is a series of dietary adjustments and food choices meant to help speed recovery from the ulcer and get your stomach back into normal shape. Additionally, an ulcer diet is designed to minimize any possible aggravators that can cause unnecessary pain from the stomach ulcer. The most common cause of a stomach ulcer is infection by H. pylori bacteria. These things are commonly present in the environment and don’t normally cause problems, but sometimes they can cause inflammation that deprives the stomach of its protective lining. Long term use of NSAID drugs like aspirin or ibuprofen can weaken the lining. Zollinger-Ellison syndrome is a rare disease that causes excessive stomach acid production, overpowering the lining. Similarly, excess acid can be a result of genetics as well. Burning sensation or stomach pain in the area between the chest and the breastbone. The pain may be more intense when the stomach is empty and can last anywhere from a few minutes to several hours. Since most stomach ulcers are the result of H. pylori infection, antibiotics are the standard treatment. While waiting for the medicine to finish its job and eliminate the bacteria, a special “diet for stomach ulcers” or an ulcer diet can be used to minimize your discomfort and any stomach pain. Flavonoids: A key part of any diet for stomach ulcers, flavonoids have a known gastroprotective effect and can make the stomach lining more durable. A number of fruits and vegetables contain flavonoids including apples, berries, legumes, soybeans, red grapes, most teas (especially green tea), cabbage, kale, and carrots. Fruits like kiwi and orange also have flavonoids but are best avoided when selecting foods for a stomach ulcer due to their acidity. Flavonoid supplements are best avoided in an ulcer diet for two reasons. The first is that ulcer pain is lessened when you have food in your belly, so giving your body something to actually digest is preferable to a pill. The second is that excess flavonoids can cause issues with blood clotting and it’s easier to get too much when using supplements. Probiotics: One of the ways that H. pylori can get a foothold in your body is if it has less competition to deal with from the good bacteria that normally inhabit your digestive tract. 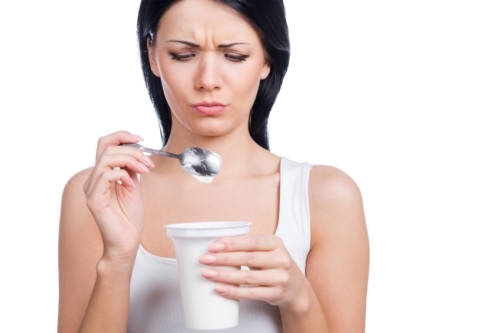 Probiotics serve as a way to boost the numbers of good bacteria and help crowd out the unwanted ones. Probiotics can be found in a number of products like milk (fermented and unfermented), buttermilk, certain soft cheeses, tempeh, kim chi, pickles, and of course, yogurt. Vitamin A: Although keeping up on your vitamins with fruits and vegetables is important in general, a stomach ulcer diet should be rich in vitamin A since Vitamin A promotes the production of intestinal mucus. While vitamin A alone won’t stop an ulcer, it can help speed up recovery as the underlying cause is addressed by other methods. Sweet potatoes, kale, spinach, broccoli, and liver are good sources to consider. As mentioned, a key part of a diet for stomach ulcers is making sure to avoid foods that will aggravate your stomach pain. Acidic drinks: Coffee, carbonated beverages, and citrus juices are all acidic and can aggravate a stomach ulcer. Since it’s the acidity that causes the problem it won’t matter whether you use caffeinated versions of the drink or not, either. A stomach ulcer diet should stick to non-acidic drinks or plain water. Citrus: If citrus juices are too acidic for an ulcer diet, then the fruits themselves are definitely out. You’ll need to wait for the ulcer to clear up before you can properly enjoy grapefruits, tomatoes, lemons, oranges, and the like. Spicy foods: This one is more subjective since some people find that spicy foods can aggravate an ulcer while others don’t. Unless you’re willing to experiment, it’s best to err on the side of caution and avoid chills, hot peppers, and similar spiciness for the time being. Fatty foods: Whether deep-fried, buttery, overly-processed, or even a thick slab of meat, fat should be kept to a minimum when possible in a stomach ulcer diet. Fat can make your stomach produce more acid than normal, which is the last thing you want when dealing with an ulcer. Milk: Milk’s ability to coat the tongue and throat are one of the reasons it’s able to combat spicy food, so it’s not unreasonable to think it can do something similar to the stomach. Drinking milk can cause short-term relief from stomach ulcer pain but is best left out of the diet in the long term. Remember: milk has more fat in it than most drinks, which means it can cause more acid production. Smoking: Smoking can promote acid production and further weaken the mucus lining. If you smoke, cut back or quit. Excess smoking, alcohol consumption, and NSAID use are all considered risk factors for developing a stomach ulcer. Standard lifestyle changes like cutting back on drinks or cigarettes or finding alternative pain relievers are best considered alongside an ulcer diet. Common sense steps to prevent the spread of H. pylori can also be utilized, like washing your hands before handling food and cleaning fruits and vegetables. Johnson, S., “Stomach Ulcer,” Healthline web site; http://www.healthline.com/health/stomach-ulcer#Overview1, last accessed March 7, 2016. Krans, B. et al., “Natural & Home Remedies for Ulcers,” Healthline web site; http://www.healthline.com/health/natural-home-remedies-ulcers#2, last accessed March 7, 2016. “Peptic Ulcer – Lifestyle and Home Remedies,” Mayo Clinic web site, July 26, 2013; http://www.mayoclinic.org/diseases-conditions/peptic-ulcer/basics/lifestyle-home-remedies/con-20028643, last accessed March 7, 2016. Tseng, T., “Diets For Stomach Ulcers: Tips On What To Eat,” Symptomfind.com, May 30, 2014; http://www.symptomfind.com/nutrition-supplements/diet-for-stomach-ulcers-tips-on-what-to-eat/.